I stumbled onto a Luther Allison site today. He as great blue guitarist who died just as he was finally getitng some fame in the late 90s. I wrote the liner note for a posthumous live album on Alligator Records and totally forgot I had done so. They were posted on his site. so I’ll share them here. 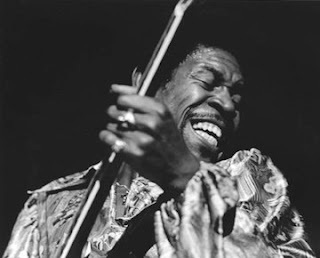 LUTHER ALLISON had a lot to prove when he climbed on stage at the 1995 Chicago Blues Festival. But that’s nothing new. Blues musicians have always had to prove it all night, every night. Careers are still made or broken on sweaty, beer-soaked stages in front of a few hundred people at a time. But every once in a great while, a blues musician is presented with a rare opportunity to radically expand that scope the chance to reach hundreds of thousands of listeners in a single swoop. Such was the case for Allison on June 3, 1995. Over the previous 12 years, since his move to Paris, Luther had made himself into a European star. The price he paid was giving up a career in his homeland, a career which exploded in the late ’60s and flourished in the ’70s, but never reached the heights predicted by many. The Blues Fest presented a golden chance to help him reestablish himself on these shores. A year prior, he had released Soul Fixin’ Man, his first American album in seven years, then pounded the clubs, spreading the word that he was back home and better than ever. Though he had yet to reach the crossover rock audience which awaited him, his name was again becoming revered by blues fanatics, and he was rapidly winning converts the old-fashioned way — with phenomenal three and four-hour shows that were emotionally gripping feats of physical endurance. “I put out until they pull the plug,” he told me just six months or so before his 1997 death from cancer. “First, I love every minute of it. And, second, I am on a mission to regain my name at home.” Allison’s success was highlighted by the dozen W.C. Handy Blues Awards he received over the last three years of his life, including the coveted Blues Entertainer of the Year in 1997 and again, posthumously, in ’98. It was a remarkable run, and it was only gaining strength when Allison was stricken while touring in support of the Grammy-nominated Reckless, his third excellent album in four years. In many ways, this last great chapter in Luther’s life began with that ’95 performance at the Chicago Blues Fest in front of some 150,000 people and thousands more listening on National Public Radio. Remarkably, Luther had played a festival in Nantes, France, the night before and flew back to Paris, where he boarded a jet bound for Chicago. When he took the stage, his 55-year-old bones hadn’t seen a bed in two nights, but you won’t hear any signs of jetlag throughout the blistering 60-minute set captured on Disc One. With the rock-solid James Solberg Band kicking it behind him and the Memphis Horns adding their trademark punch to five songs, Luther ripped and snorted through a condensed version of his lengthy shows. 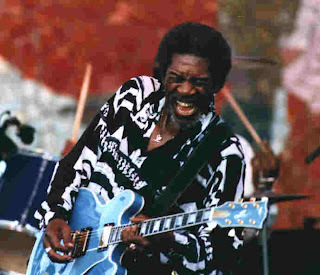 The rousing set featured a wide range of material from both Soul Fixin’ Man and its followup, Blue Streak, at the time recorded but not yet released. As usual, the spotlight was on Luther’s passionate intensity, which flowed through his slashing guitar work and gravelly, soulful vocals. It’s revealing that in his big homecoming gig, Luther insisted on playing a set dominated by original tunes, many co-written with Solberg. The songs reveal a strong songwriting hand, thoughtfully tackling discrimination, inner-city decay and welfare reform along with more typical blues topics like heartbreak, longing and adultery. His second number was Blue Streak’s Cherry Red Wine, a moving condemnation of a hard-drinking friend, which would soon become one of his most requested numbers. That night, Luther was thrilled to be preceding his idol, Otis Rush, and overjoyed to revisit his roots by returning to the stage to join him for the Festival’s final jam. Along with old compadre Eddie C. Campbell, they took on B.B. King’s Gambler’s Blues and Sweet Little Angel. Luther’s guitar playing hailed from Rush’s West Side school of Chicago playing; like Magic Sam, Freddie King and Jimmy Dawkins, he favored hard-driving, piercing single-note leads with a soul base and a rock tone. Unlike most of his West Side peers, he was also an excellent slide player, as displayed on Hound Dog Taylor’s Give Me Back My Wig and Tampa Red via Elmore James’ It Hurts Me Too. Slide or straight, Luther’s playing tended to be reckless in the best sense of the word, dancing on a razor’s edge, remaining just this side of out-of-control. His singing was also a marvel rich, emotive and edgy. At times, he even came across as a guitar-toting Otis Redding, as on Disc Two’s You’re Gonna Make Me Cry. All of it was put across with a full-tilt intensity that reflected Luther’s passion and his determination to prove himself as one of the all-time greats. From uptempo, party-down rockers to contemplative, longing blues and from bouncy, horn-driven soul tunes to organ-fueled, gospel-style ballads, he performed with the fiery energy of a teenager and the grizzled soul of a veteran. Luther’s life was dedicated to his music. Born in Widener, Arkansas, in 1939, the 14th of 15 children, Allison and his family moved to Chicago when he was 12, and he began soaking in the sounds of Muddy Waters, Sonny Boy Williamson and Robert Nighthawk. He didn’t start playing guitar until he was 18 and was quickly jamming with the West Side’s best, including Rush and Freddie King, who encouraged Allison to sing. “That,” Allison liked to say, “was my school.” When King began to tour nationally in the early ’60s, Allison took over his band as well as his weekly gigs. Still, it was 1969 before he recorded his debut album, Love Me Mama, for Delmark Records, and began to tour nationally. A barn-burning performance at the 1969 Ann Arbor Jazz and Blues Festival helped him make a name, and soon a dashiki-wearing, Afro-sporting Allison was a hippie favorite. His career was on the upswing in ’72 when he signed with Motown Records as the label’s only blues act, but three records for the Gordy subsidiary failed to launch him. Hard work and lots of touring began to bring Luther wide acceptance in Europe just as interest in the blues was fading at home, so in ’83 he moved to Paris and began turning himself into a European star, releasing some dozen albums. In the meantime, his presence at home faded ever more, but his ability to invest all of himself into emotionally complex and mature performances only deepened. And so Allison hit the highway, barnstorming America, gaining fans one revelatory show at a time. The second disc of this set mixes tracks from two typically fiery club performances, one from Buddy Guy’s Chicago Legends just four months after the Blues Fest, and the other from one of his last shows, at Lincoln, Nebraska’s Zoo Bar. The latter tracks, though not recorded in Chicago, are performances so strong that they had to be heard. Listening to the joy he invests in Party Time and the cut-to-the-bone passion with which he digs into What’s Going On In My Home?, Will It Ever Change? and You’re Gonna Make Me Cry, it’s impossible to conceive that Luther’s body was already starting to fail him. It says a lot about his attitude and love for the music that he remained on the road, playing the blues as long as he possibly could. Of course, he couldn’t have known that soon after he said this he would be gone. That he died on the doorstep of achieving the domestic recognition that he so longed for is a tragedy that one could spend a lifetime pondering without ever making sense of. Alan Paul is an Associate Editor of Guitar World and the editor of www.guitarworld.com.